In a mixing bowl, stir together sausage, cheese, dressing and olives; set aside. 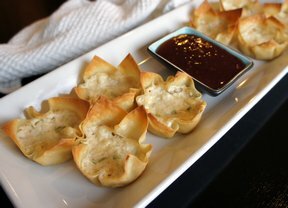 Press wonton skins in muffin tins creating a flower-like "cup". Bake for 5 minutes. Remove and let cups cool. 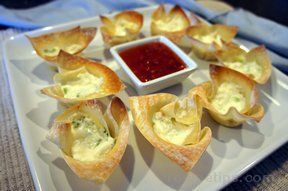 Fill each with a tablespoon of filling. Return to oven and heat until filling bubbles. Filling can be made ahead and stored in refrigerator. Cups can be made ahead and stored in an airtight container.